Color plays a huge role in my life! Whether it’s my favorite shirt or the color of a room, color influences me daily. It should be no surprise since my blog name is A Shade of Teal! 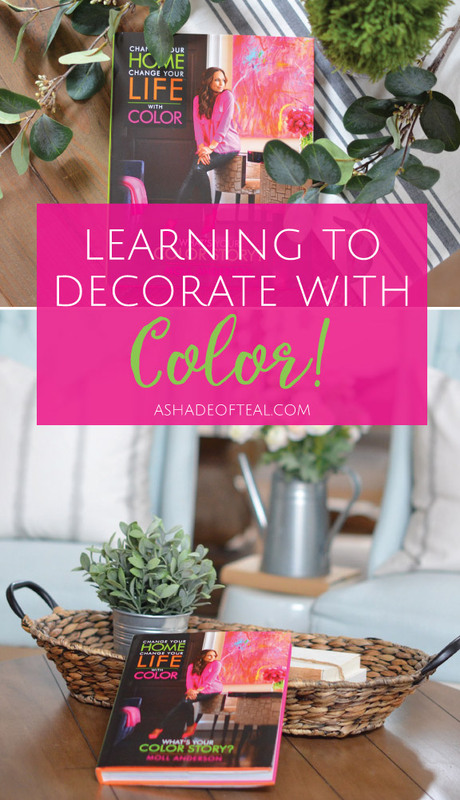 But when it comes to decorating with color some might find it challenging. That’s why I’m so excited to introduce you to Change Your Home, Change Your Life™ with Color by Moll Anderson. 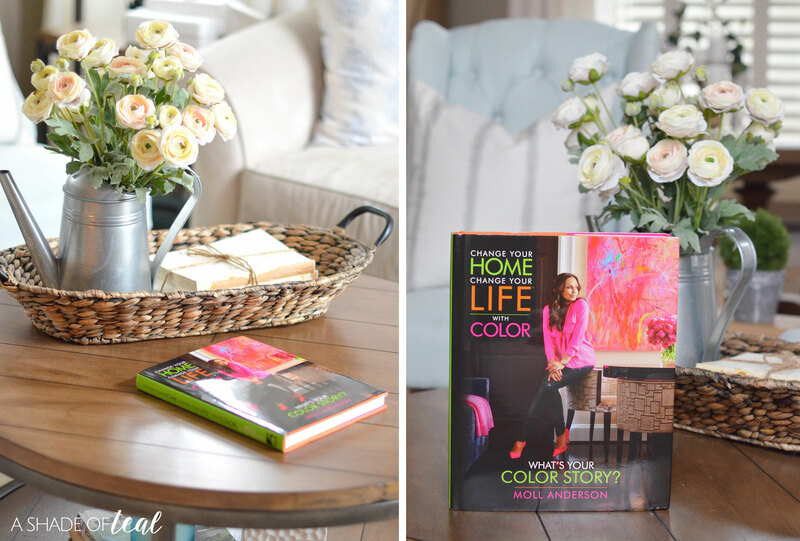 Moll’s book discusses all things color and home. 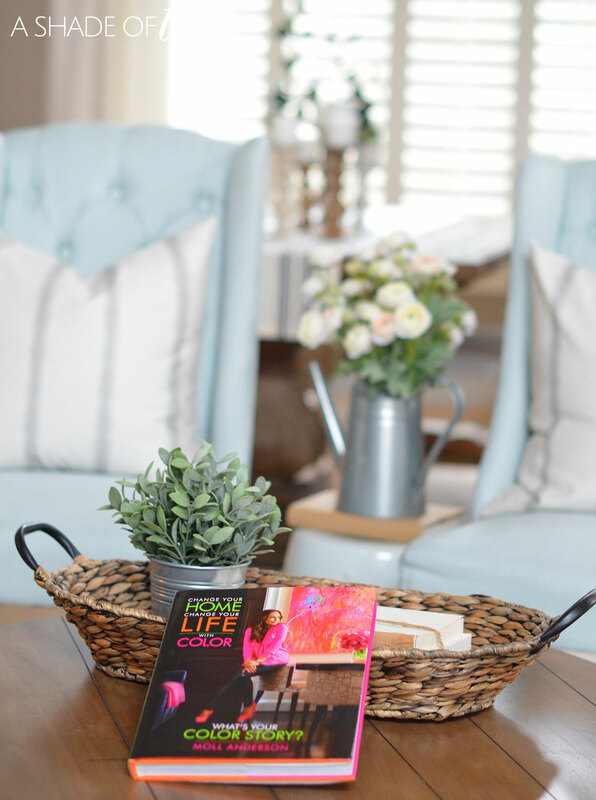 She breaks it down by color hue, helping you discover just how amazing color can transform your home and life. Her book includes worksheets for you to fill out the questions which will help discover the perfect color for you. Without a doubt, Teal has been and will be my favorite color. From the time I was a little girl I was drawn to anything in the Teal/Aqua/Turquoise family. Something about the color makes me calm and happy; making decorating my home in the hue an easy choice. While reading Change Your Home, Change Your Life™ with Color, I also found myself drawn to several other colors. Not only does Teal/Aqua/Turquoise play a major role in my home, I also tend to always balance it with Neutrals. 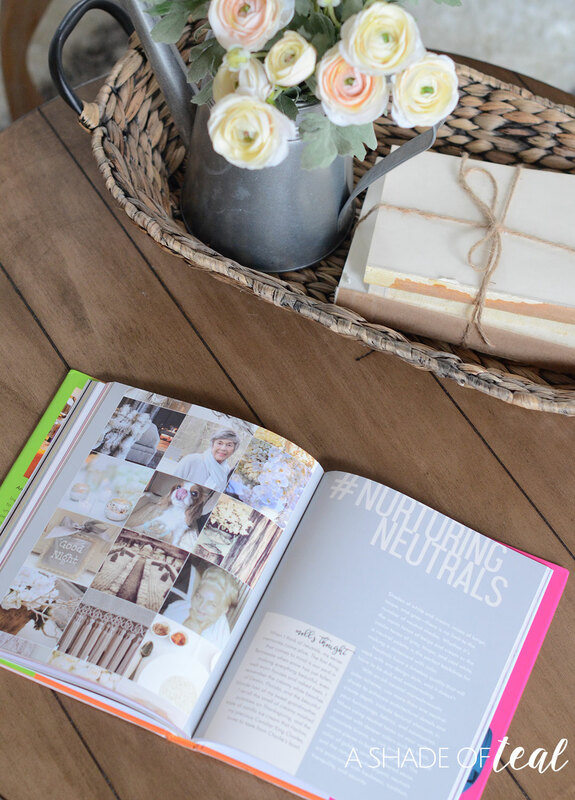 Some might find neutrals to be boring, but I personally find them to be calming and relaxing. I also love having the base of every space be neutral, that way I can inject a color as I please. If your scared to get started with color then slowly start by adding color through accessories. 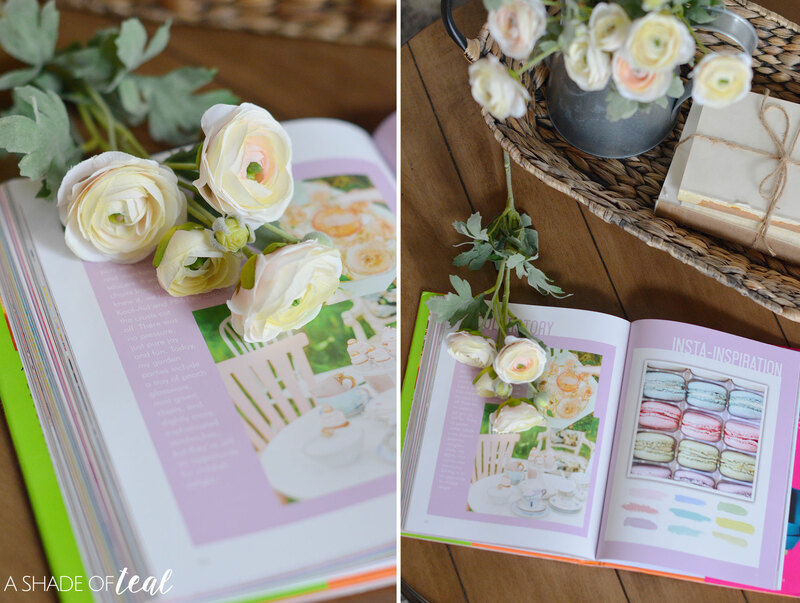 Her book gives great examples on how to start with colorful accents. Moll Anderson’s work as a interior designer is truly inspiring and her work can change beyond the home, with advice and inspiration for your home and life! She introduces a whole new way of thinking about the link between color and mood. After reading her book, I have a deeper understanding as to why I love the color Teal. It reminds of the crystal blue ocean water from vacations past. The color calms me and makes me wishful of a future vacation! 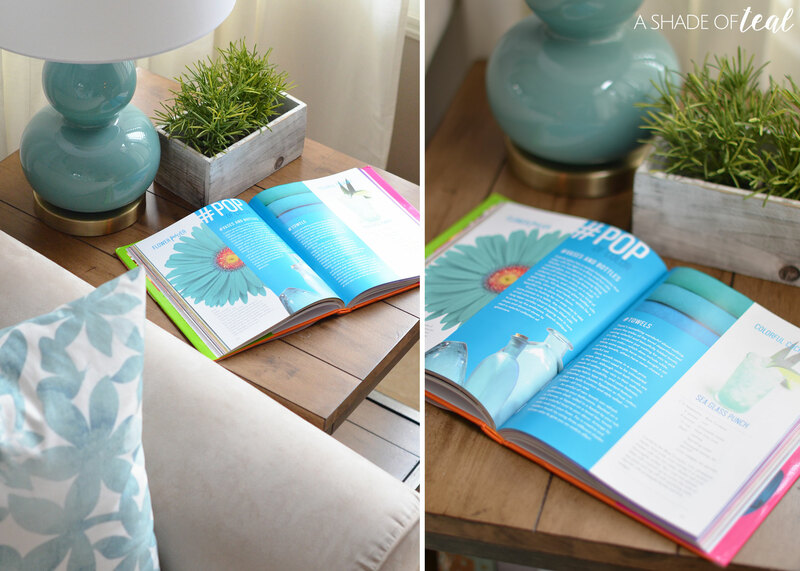 So, whether it’s a touch of color to change the energy of a space, or a colorful canvas print, there is something for everyone in this book to inspire you to live every day more colorfully! 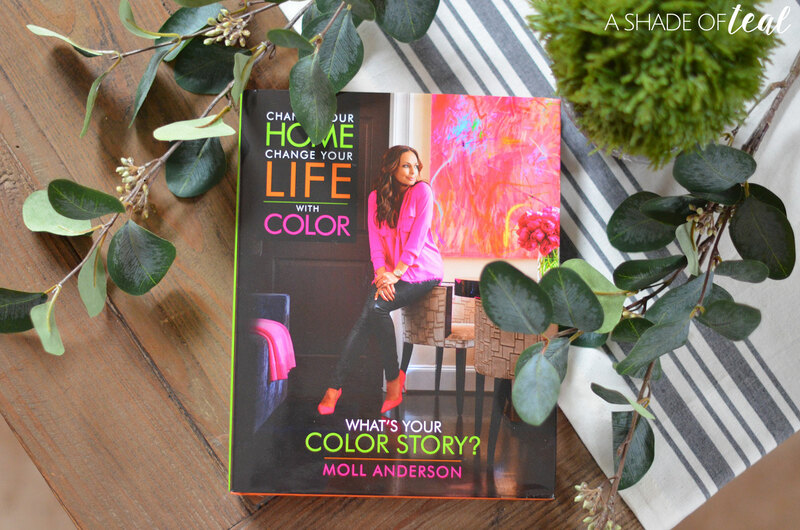 You can find Change Your Home, Change Your Life™ with Color by Moll Anderson in Target stores March 14, 2017 or anywhere books are sold online (MollAnderson.com, Amazon, B&N and Books-A-Million). So what’s your color story? I hope you pick up her book and find it as inspiring as I do! « How to make a St. Patrick’s Day Lucky Sign, + 3 Tier Tray Decor! Looks like a good book! Thanks for sharing… may just have to go pick it up! My house is pretty bland when it comes to color. I sure could use some! Thanks Robin! This book will come in handy then. I know what you mean, my husband prefers more neutral colors as well. Thanks Amy! I typically stay with neutrals a well, but playing with color has been so much fun! I could definitely use a book like this! Much of our house is done in neutral tones and a few pops of color is just what the spaces need to feel a bit more warm. I never thought that color can be a reflection of our state of being. I prefer a simple but elegant theme in my house and I think pastel can add more mood of fun and youthfulness in our home. I’ll check a copy of that magazine. Thanks Sarah, you’ll love this book! I love pastel shades and white. However, they are difficult to maintain and I have seen more homes being painted with bolder, darker colors. I will have to check on this. We may have to go through repainting the entire house soon as the weather is good. You’ll love reading this book then, it gives great tips. I totally love this smart tips and ideas! I love light colors especially in our room. I keep everything white and grey in my home. I actually feel like i could veer into the world of colour! Great advice in the book! Yes, it definitely has great advise to add color. Colors can be tricky and it would be awesome to learn more about choosing the right ones especially if it’s all about your home. I think this is a lovely book! Thanks Elizabeth, you’ll love reading it. Looks like a great book. I need to add a few splashes of color to my living room but have been hesitating as I was not sure about combining them. Need to get my hands on the book now. This book will definitely help with that, good luck! This sounds like a great material to have. Would love to learn more things about colors and decoration. Hope I can get my hand on this one. Thanks Ron, it’s available online now. I love pops of color! I can’t wait to add some pops of color of my own!! This is my first time to heard about pops color! It ‘s interesting to me.